A southern staple, fried chicken options abound near Grove Park. In July, 2017, the Charlotte Observer ran a story about the Great Carolina Fried Chicken Map “which points the way to 300 fried-chicken nirvanas” in the Carolinas. While I haven’t seen the map, I’m certain that it has nothing on Grove Park’s fried chicken options! 1. Pollo Compero: 5727 N Sharon Amity (next to Wendy’s). At Pollo Compero, you’ll only find chicken entrées on the menu – fried or citrus grilled. When they first opened, the line was out the door and around the building. According to one of my coworkers, when they opened it meant that “Charlotte had finally arrived!” One of the first times I enjoyed chicken here, a man originally from Guatemala, where Pollo Compero orginates, assured me that their fried chicken was better than KFC. I agree, it’s pretty darn good. If you dine in, your food is served on ceramic plates, a nice touch for a fast food restaurant. Try the street corn salad and yucca fries for unique sides. The staff at the counter are fluent in both English and Spanish, so no worries if you don’t happen to speak Spanish. 2. Parkway House: 5820 Harris Blvd. Fried Chicken is the Sunday daily special, served with two vegetable sides, yeast roll or cornbread. You can also get a fried chicken filet sandwich or fried chicken liver entree. If you’re really into fried foods, their fried squash is amazing. You’re likely to see Grove Park neighbors when you visit Parkway, so be sure to be neighborly and say hello! 3. 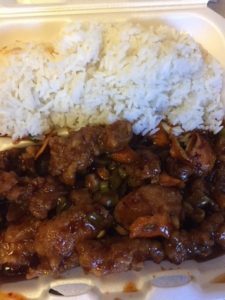 Panda’s Den: 5724 Harris Blvd. Chunks of chicken, fried crispy and sautéed with hot peppers and aromatic orange flavor. You’ll find lots of orange zest in this dish. 4. Krispy Krunchy Chicken at 786 C-Store: 2824 Milton Road. I had heard about fried chicken available in convenience stores, but this was my first experience with it and it did not disappoint. 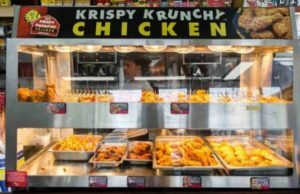 Per their website, Krispy Krunchy is “one of the fastest growing convenience store based quick service restaurant concepts in the nation.” This store was reopened last year by a lovely young man named Mohammad. He and his partners invested a lot in both exterior and interior renovations, and while that alone should inspire Grove Park neighbors to want to support them for the positive change they’ve made in our community, the chicken really is worth a trip. It might feel a little strange to some to buy chicken in a c-store, but give it a try – you just might be surprised. 5. Chicken King: 7016 WT Harris Blvd. With several locations in Charlotte, Grove Park is fortunate to have this one close by. Here’s what one reviewer said of their fried chicken: “I always go for the Chicken Tender Platter. The chicken is perfectly seasoned and cooked. The value is great for the quality and portion that you get.” When I stopped by last summer to tell the staff about the July 4th parade, they were so excited. Any business that loves our local parade has to be great, right? 6. Floyd’s Soul Food: 1820 Milton Road. Known for their soul food, you can bet fried chicken is on the menu. 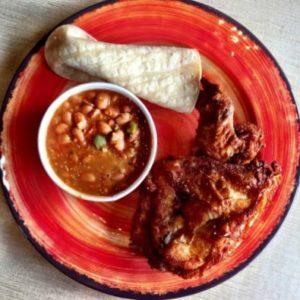 Though I’ve not yet been to Floyd’s, let’s plan a neighborhood outing there soon to support another of our local great spots for fried chicken! Grove Park’s neighborhood speed limit is 25 MPH	Delta Creek Park Online Scheduler is now available! Delta Creek Park Online Scheduler is now available!